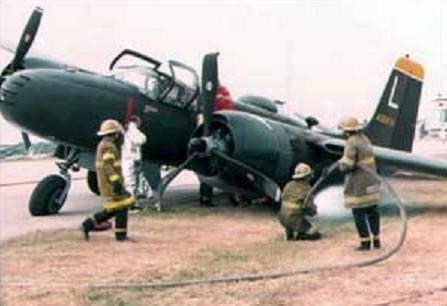 The above two shot shows "161" ( before and after) at the Fort Worth International Airfest on October 17, 1987, the landing gear collapsed as the pilot taxied to the hangar. 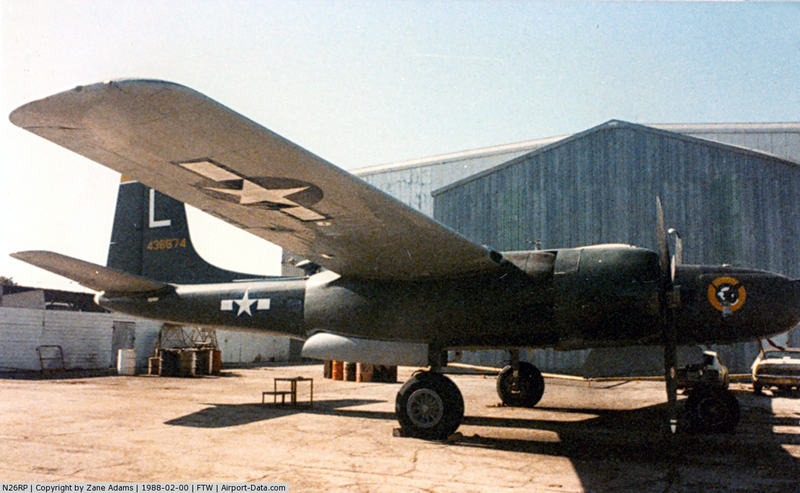 So the story goes " The A-26 was at Meacham for a Chuckie airshow when the one of the main gear folded while taxiing. Chuckie told us that Tommy Thomas owned it at the time. 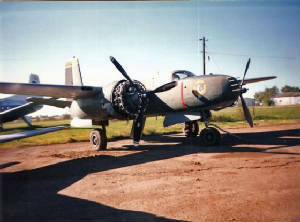 It was parked inside the infamous fence in front of Chuckie's hangar. Jr. and someone else showed up and installed a junkyard engine ( they didn't have enough oil for the engine so they went around the airport and got the oil they needed from the waste barrels of the FBO's) and prop on the bad side, worked on the gear lock and proceeded to fly it out. Things didn't go well on the takeoff and it was aborted. Turned out that there was a problem with the nose gear shimmy damper and they darn near shook the nose off of it. They taxiied back and parked it. They also crudely patched the right side canopy clamshell with a crude fiberglass and resin patch". It was repaired and subsequently ferried to Paris, Texas, where it sat for a number of years. 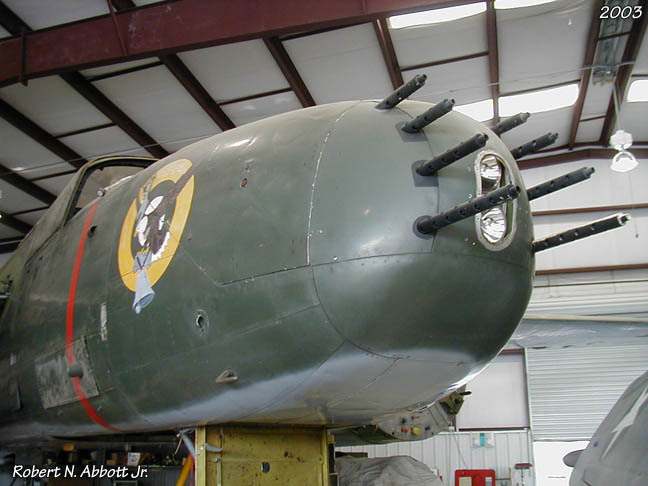 The plane was purchased in 1996 and trucked to the Fighter Factory in Virginia where it is in the final stages of total restoration. If you look closely you can see the bent prop on the port side. Registered as N1470V by ?? ?, 19??. Humphrey's Gold Corp, FL, 1956. Humphrey's Engineering Co, Denver, CO, 1963-1966. Metropolitan State College, Denver, CO, 1969. Air Mayo Inc, Lakewood, CO, 1972. Slaco Inc, Fort Lauderdale, FL, 1977. Robert P. Lammerts, Oklahoma City, OK, Sep. 1981-1984. 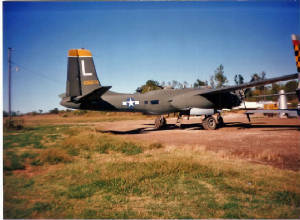 ADA Aircraft Museum, Oklahoma City, OK, 1986-1990. Colonel Aircraft Sales, Oklahoma City, OK, May 1991-1995. Gerald Yagen/The Fighter Factory, Virginia Beach, CA, Nov. 1996-2004. - Under restoration to airworthy, Norfolk, VA, 1996-2004.